If you just got a puppy or dog, you probably have questions about how to housebreak your new pet. Dr. Mary Burch offers some fresh insight and tips perfect for first-time dog owners and anyone who wants a refresher course in house training methods. 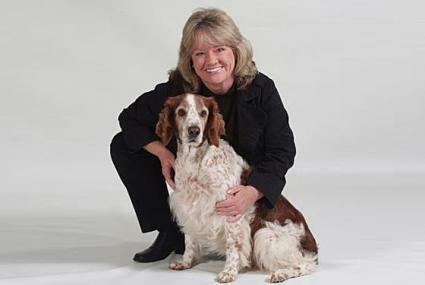 Dr. Burch is the American Kennel Club® Canine Good Citizen® Director. She's also one of just a handful of Certified Applied Animal Behaviorists in the USA. LoveToKnow is happy to be able to draw on her expertise to learn the best training methods to housebreak puppies as well as adult, rehomed pets. LoveToKnow (LTK): Dr. Burch, a new puppy presents us with a lot of joy, but also with a lot of training challenges. Housebreaking always seems to wind up at the top of the list. What's the best way to begin housebreaking a new puppy? Do you have a preferred method? Dr. Burch: There are several methods that can be used to house train your new puppy. The most commonly used methods include 1) crate training, 2) very frequent trips outdoors, and 3) paper training. While there are pros and cons of each of these methods, each of them can be successful if you follow a few simple rules. Finally, keep your puppy's developmental level in mind. Puppies don't have complete control of their bladder and bowels just yet, and they need more frequent trips outdoors than mature dogs. LTK: Is crate training helpful to the housebreaking process? Many of our visitors report that their puppies are just as willing to soil in their crate as they are anywhere else in the house. Is there a way to address that issue? Dr. Burch: It's so frustrating when a puppy owner tries to do the right thing by crate training a puppy only to have it soil its crate. Dogs that come from pet stores, shelters or other situations where they have been confined for long periods will often soil their crates. This happens because they have previously had no other choice but to eliminate in their kennels. I would suggest starting over with house training and crate training. As a first step, do an assessment of how well your dog can control his bladder and bowels when he's not in the crate. If you are at home on the weekend, how long does the dog go between trips outside? How about at night? Does the dog sleep in the crate or in your room? Is the dog in the crate all day when you are at work? Is the soiling occurring during the night or when you are at work during the day? For a puppy, several hours in a crate can exceed his limit when it comes to bladder and bowel control. Start over with controlling the diet and schedule, provide frequent trips outside after every meal, a final trip outside at night before you go to bed, and a trip outside first thing in the morning. If you have a long workday, consider having someone come and take the dog outside for a mid-day break. Clean the crate and any bedding so it is free of any scent from urine or feces. If you think your dog is stressed out when you are gone, you can consider leaving him with a safe, interactive toy. Depending on the size and age of your dog, you could consider taking a break from the crate and trying your pup in an exercise pen or a room secured by baby gates while you are gone. Whatever you do, don't punish your dog for accidents. Continue to give a lot of praise and treats for a "job well done" outside. 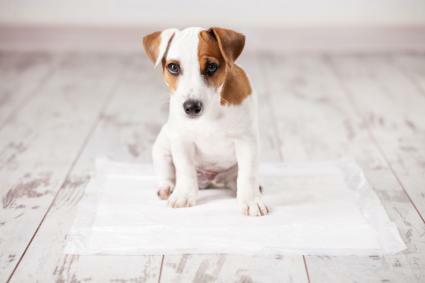 LTK: Many of our readers also ask if they can train a puppy to use puppy pads indoors while they're at work and still train him to go outside after they get home. Is this possible, or will it just confuse the puppy about what's acceptable potty behavior? Dr. Burch: In some cases, this could be tricky because you're reinforcing two different options for the puppy. Ideally, the pup would simply be house trained to go outside. However, sometimes we have situations that require a creative approach, and using the puppy pads indoors combined with learning to go outside can be a good solution. In particular, this would work well for a puppy owner who works long days and is unable to take the young puppy outside every few hours. It would also work well with a small breed living somewhere with brutal winter weather. The puppy pads would provide the humane option of allowing the puppy to relieve himself in an acceptable location indoors. When the pup is more mature, the owner may choose to make outdoors the only option by gradually fading the use of the puppy pads. LTK: How long should it really take to housebreak a puppy on average? Dr. Burch: The length of time it takes to house train a puppy can vary greatly based on the puppy's age and learning history, as well as your consistency. An eight-week-old puppy is very different developmentally than a five-month-old puppy. With regard to learning history, if your new 12-week-old puppy came from a responsible breeder who was already working on systematically house training the litter, this puppy would most likely have a good head start on house training basics. With some puppies, it takes three to four weeks for house training, and with others, training can take four to five months or longer if the dog has had a less than ideal situation before coming to you. LTK: What is the best way to handle house accidents, from a training standpoint as well as proper cleanup to prevent the pup from being drawn back to the area to soil again? Dr. Burch: Whatever you do, don't punish your dog for a house training accident. By punishment, I mean any harsh corrections including hitting the dog, rubbing his nose in urine, or screaming and yelling. If your dog has an accident, simply clean it up without making a fuss. Use a cleaner with an odor killer (available at pet supply stores) that will remove the scent so the dog is not likely to use the 'marked' spot as a bathroom area in the future. For carpeting, blot up any liquid before cleaning the area. If you catch the dog starting to squat before urinating or defecating, pick him up and immediately rush outside. If he does the job outdoors, give him praise and attention. Remember that when it comes to house training, prevention is the key. LTK: Many people adopt adult dogs only to find they aren't properly housebroken. This situation all too often winds up with the dog being returned to the shelter. Is it possible to housebreak an adult dog that wasn't properly trained as a pup, and if so, how should they go about it? Dr. Burch: There is hope for adult dogs that have a history of not being house trained, but the investment of time and work to fix this problem will require some tenacity and determination on the part of the owner. Basically, you should approach this situation as though the dog is a very young puppy. After a vet check to rule out medical problems, begin with very short times between outdoor trips. Can the dog control its bladder and bowels for an hour? Two hours? Regulate the dog's diet and feeding schedule. After every meal, go outside for exercise. Use praise to reinforce the dog for urinating and defecating outside. Depending on the dog and how long you need to be gone each day (For example, do you have a 10-hour workday? ), consider giving the dog an acceptable indoor bathroom option. This will be a less likely choice for a large or giant breed. Consider a dog walker if you are gone for long periods of time. Finally, if you are devoted to this dog and your work schedule is getting in the way of getting the house training under control, consider taking a few days off so you can try an intensive several day long, around-the-clock training session. LTK: Is there such a thing as an untrainable canine when it comes to housebreaking? Some of our readers often say they've tried everything and yet their pet still soils in the house. Do you have any advice for people in that situation? Dr. Burch: No matter what the owner seems to try, after several months, some dogs are still not house trained. Well before the several month mark, a dog that has seemed impossible to housemtrain should have a good veterinary work-up. Once the dog has a clean bill of health showing there is not a physical problem, a good tip would be to consult with an animal behaviorist or an experienced dog trainer. Look for someone who would be willing to observe your dog, complete an assessment, and develop a behavior plan for you. As you can see, it takes patience, a positive approach, a real plan tailored to your pet's current abilities and persistence to house train any dog properly. Use Dr. Burch's tips and expertise to make your mission successful.